Customs in Common is the remarkable sequel to E.P. Thompson's influential, landmark volume of social history, The Making of the English Working Class. 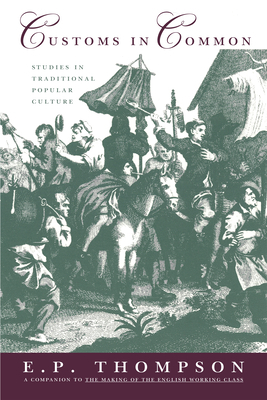 The product of years of research and debate, Customs in Common describes the complex culture from which working class institutions emerged in England--a panoply of traditions and customs that the new working class fought to preserve well into Victorian times. In a text marked by both empathy and erudition, Thompson investigates the gradual disappearance of a range of cultural customs against the backdrop of the great upheavals of the eighteenth century. As villagers were subjected to a legal system increasingly hostile to custom, they tried both to resist and to preserve tradition, becoming, as Thompson explains, "rebellious, but rebellious in defence of custom." Although some historians have written of riotous peasants of England and Wales as if they were mainly a problem for magistrates and governments, for Thompson it is the rulers, landowners, and governments who were a problem for the people, whose exuberant culture preceded the formation of working-class institutions and consciousness. Using a wide range of sources, Thompson shows how careful attention to fragmentary evidence helps to decode the fascinating symbolism of shaming rituals including "rough music," and practices such as the ritual divorce known as "wife sale." And in examining the vigorous presence of women in food riots from the sixteenth century onwards, he sheds further light on gender relations of the time. Essential reading for all those intrigued by English history, Customs in Common has a special relevance today, as traditional economies are being replaced by market economies throughout the world. The rich scholarship and depth of insight in Thompson's work offer many clues to understanding contemporary changes around the globe. E.P. Thompson (1924-1993)was one of England's foremost historians and social critics. He was the author of many books, including The Making of the English Working Class and Witness Against the Beast: William Blake and the Moral Law, published by The New Press.